To find out about cultural identity, you have to return to the home fires, to the kaik, the whānau and the whenua. Areta Wilkinson understood that when she returned to Christchurch eight years ago, driven by a desire to reconnect and find out more about her whakapapa. 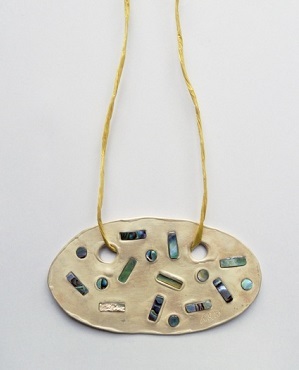 Areta (Ngāi Tahu –Ngāti Irakehu) was always aware of her Ngāi Tahu roots growing up in Kaitaia in the Far North and when she returned to Christchurch, she was keen to find ways to contribute to Ngāi Tahu as an adult and as a practicing contemporary jeweller. 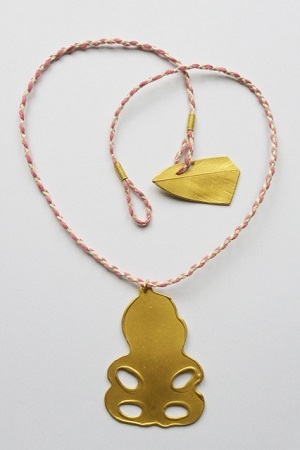 Today she is one of a handful of contemporary Māori jewellers in New Zealand and as she contemplates her current exhibition, Whakapaipai: Jewellery as Pepeha, at Canterbury Museum, she says the work is about treasuring – both taonga (wearable personal adornments) and the knowledge transfer that surrounds them. Hine-Āhua, 24 carat gold (Tai Poutini). “This show is very significant for me both in terms of art practice directly interacting with culture. At its simplest it is about cultural practice, responding to the world we live in, this includes acknowledging the past from this contemporary point in time,” she says. 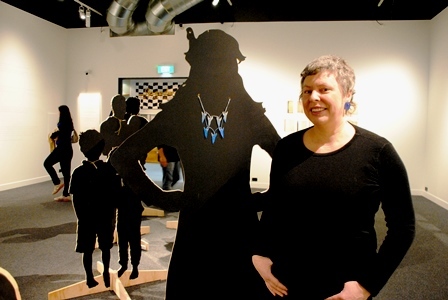 Areta completed the body of work for her PhD in Fine Arts at Te Putahi-a-Toi School of Māori Art, Knowledge and Education at Massey University in Palmerston North. It was a project that began over six years ago in 2008 and it has been strongly driven by whakapapa and whānau relationships. “The nature of pepeha announces, distinguishes, identifies and locates. Jewellery as Pepeha is located in the remnants of memory and knowledge; in whakapapa and in whenua; in the legacies of belonging, of sustenance and in the spirit of continuum – taoka tuku iho”, writes Moana Tipa in the gallery text. The exhibition is made up of a number of strongly linked bodies of work that investigate Wilkinson’s concepts in different ways. A series of silver bromide photograms and cyanotypes (blue prints) have been created in collaboration with Wilkinson’s husband and photographer, Mark Adams. These imaging processes produce negative silhouettes that record the space around an object – in this case, taonga from Te Waipounamu in museum collections. Different from a photograph they offer a dark, mysterious, shadowy presence of treasured taonga and they have directly inspired Wilkinson’s collection of contemporary silver and gold adornments that are displayed on the black silhouettes of living contemporary Māori artists. Recordings of Hei Kōrerorero with hapū experts (and Wilkinson’s whānau), Peter Ramsden, George Tikao and Riki Pitama, tie selected jewellery works to site specific Banks Peninsula locations. A final component of the show is the large photograph of a ‘whakapapa’– a working register held in Canterbury Museum, that once belonged to Louis Vangioni (1935). The entries are specific to Banks Peninsula and register the taonga Vangioni purchased and acquired. “It’s another way of introducing whakapapa into the exhibition, that subtly includes relationships with non-Maori,” says Wilkinson. The exhibition is a multi-generational, interweaving of narratives past and present, a building of historical layers, a whakapapa of ideas moving forward. Whakapaipai – Jewellery as Pepeha remains on show at Canterbury Museum until March 2015. It then travels to Objectspace, Auckland in June 2015 and the Dowse Art Museum, Lower Hutt in October 2015.